For Lehman, who grew up in Alexandria, Minnesota, it’s been a “local boy makes good” dream come true for the 1996 U.S. Open champion. This, of course, is the golf world’s biggest stage, the 2016 Ryder Cup, set for September 27-October 2 at the historic Hazeltine National, just outside the Twin Cities. And while thousands of visitors and native Minnesotans are sure to pack Hazeltine’s emerald fairways this fall, the Ryder Cup is but the latest accolade in a long, proud history of Minnesota golf. It’s is the only state to have hosted all 13 USGA championships, plus the Walker Cup, Curtis Cup, Solheim Cup, and many others. For millions of avid golfers, the Ryder Cup will showcase a golf-crazy state that has long been among the top golf destinations in the country. In fact, golf visitors ranked Minnesota fourth highest from a list of 13 top golf destinations, behind only Florida, Arizona and South Carolina. While Minnesota might be known as the “Land of 10,000 Lakes” 508 might be a better number to hang your hat on. That’s the number of incredible golf courses that call Minnesota home, and they beckon to golfers around the country every summer with their beautiful natural settings, excellent conditions, and affordability. Nearly 90% of Minnesota’s courses are open to the public, with a whopping 19 golf resorts for every taste and budget. Grand View Lodge in Nisswa. While it might be the most famous, Hazeltine National is far from the only great course in Minnesota. There are plenty of courses that appear on national “Best of” lists. The purveyor of Minnesota’s “bucket list” of must-play courses is the Explore Minnesota Golf Alliance featuring a collection of the state’s top 24 public golf facilities and resorts (a total of 33 courses) where visitors can be confident that they will have a fantastic golf experience loaded with quality of service and course condition/amenities. You don’t have to travel far from Hazeltine in Chaska to find a great course to play while in the area, either. Among the higher-end Twin Cities courses sure to impress is Chaska Town Course, which is virtually in Hazeltine’s backyard. 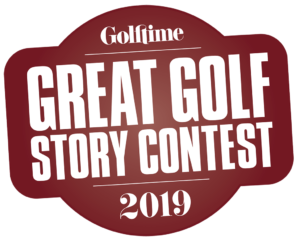 StoneRidge Golf Club in Stillwater, Legends Club and The Wilds Golf Club both in Prior Lake and Rush Creek Golf Club in Maple Grove are also atop the list of Greater Twin Cities courses. The Explore Minnesota Golf Alliance courses are on every golf con- noisseur’s list for their services as they offer country club amenities at public facilities. There are also plenty of Greater Twin Cities area top-level courses that are every bit as well conditioned and challenging as the high-end tracks. Consider Ridges at Sand Creek, Stonebrooke GC, Prestwick GC, Willingers GC and Braemar Golf Course. 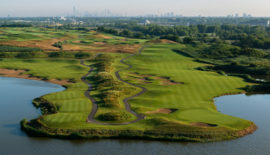 Edin- burgh USA in Brooklyn Park has hosted multiple LPGA tournaments. Located less than an hour from Minneapolis-St Paul you’ll find The Jewel, a Hale Irwin-designed gem on the Mississippi River. 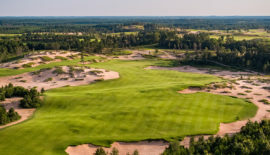 If you have a little extra time, head up north to the Brainerd Lakes Area in Central Minnesota, where you’ll find some of the finest courses the state has to offer. The Classic at Madden’s, The Pines and The Preserve at Grand View Lodge, the Legacy Courses at Cragun’s Resort, Golden Eagle Golf Club and the Arnold Palmer-designed Deacon’s Lodge at Breezy Point — named after his father — are challenging and beautiful courses that wind through quiet woods splashed with dozens of water features and teeming with wildlife. On the way to Brainerd don’t miss Territory Golf Club in St. Cloud — central Minnesota’s best. 100” courses within 20 minutes of each other. Binge on fantastic golf at Wilderness at Fortune Bay and Giants Ridge (The Quarry and The Legend). The lodging at these properties is second to none. On the way up north try Black Bear Golf Course featuring a casino resort near Duluth. 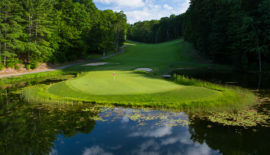 If you head to the west-northwest visit the golf resorts near Lehman’s hometown of Alexandria, Thumper Pond Resort, Geneva GC and Arrowwood Resort. While visitors with golf in mind decide on their preferred courses they can easily call on the accommodation capabilities of the Bloomington Convention & Visitors Bureau and Minneapolis NW Convention & Visitors Bureau for hotel recommendations. Chaska Town Course, one of Minnesota’s greatest golf gems. The overall quality of golf in Minnesota cannot be matched. 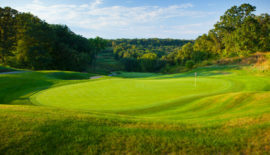 The listing of golf courses included in the Minnesota golf landscape constitutes a hall of fame of national/regional “award-winning” courses from such publications as Golf Digest, Golf Week, Golf News, Business Week, Sports Illustrated, and NGCOA, among others. All told, Minnesota’s golf has won hundreds of awards, befitting a state with some of the best golf in the world. 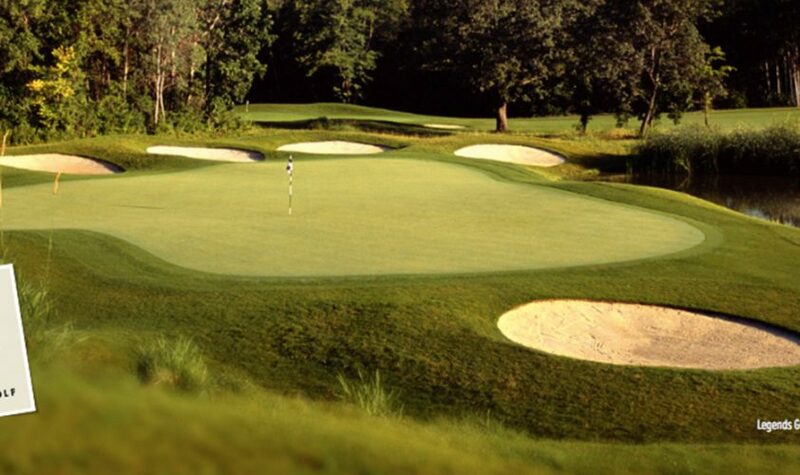 The variety of the 500+ Minnesota courses is almost endless. Golfers can opt for their favorite style — links, deep woods, breathtaking river and lake views all woven into Mother Nature’s natural beauty. Choose from family friendly par-3 and executive courses to championship courses and former pro tour sites — Minnesota has it all. No wonder Minnesota leads the nation in golfers per capita. True value is a major attribute of golf in Minnesota with green fees lower than other golf hotbeds around North America. If you’ve played Minnesota golf courses then you already understand the unbelievable value to be found at our resorts and facilities. And here’s the best part — green fees range from about $30 at the well-manicured municipal courses of Minneapolis/St. Paul to $100 for the upscale public courses surrounding the Twin Cities and resort locations around the state — seldom a greens fee beyond $100. Many facilities offer great stay & play packages. Golf in Minnesota has Ryder Cup-quality, combined with variety and true value — visit before the rush! It should be noted to those who’ll attend the Ryder Cup that Minnesotans are golf crazy, and they typically sell out professional events that come to town. Get to Hazeltine early! Visit www.exploreminnesotagolf.com for more information.